COQUITLAM – The empty lot where Burke Mountain’s new middle school should be is evidence that Christy Clark isn’t there for families in growing B.C. communities, says New Democrat leader John Horgan. “Christy Clark first promised schools in Burke Mountain in 2002. Here we are, 14 years later, still looking at an empty lot. That’s the value of Christy Clark’s promises,” said Horgan. Christy Clark first made schools in Burke Mountain a priority in 2002. But today, parents and kids are still waiting. “It’s not just Coquitlam that’s seeing these problems. In Surrey, 7,000 kids are learning in portables. Incredibly, Christy Clark’s education minister actually defended that record, bragging that there are even more portables per capita in Chilliwack. The minister may think he deserves a gold star for failing growing communities, but parents don’t. 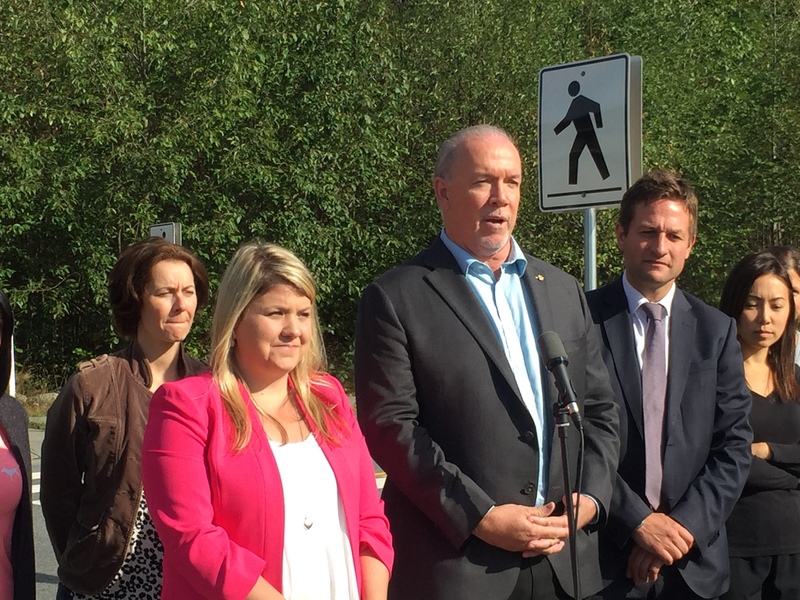 They just want stable, sustainable funding for schools, and support for their kids in their communities,” said Horgan. New Democrat education spokesperson Rob Fleming says the total failure to keep up with the demand for schools in Burke Mountain shows the value of today’s B.C. Liberal promises. “With an election around the corner, Christy Clark’s ministers are popping up across the province with random acts of education funding. They’re hoping that it will make parents forget about the years that her government has spent starving schools – years in which education funding in this province has fallen from the second best in the country to the second worst,” said Fleming. Jodie Wickens, New Democrat deputy education spokesperson and MLA for Coquitlam-Burke Mountain, says parents in Coquitlam have had enough of the B.C. Liberals’ broken promises. “A year in the life of a child is a long time. For 14 years, kids in Coquitlam have been waiting for schools that are never built,” said Wickens.